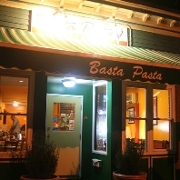 At Basta Pasta Trattoria, we pride ourselves in serving authentic, homemade Italian cuisine. We use only fresh ingredients and cook everything, including our sauces, from scratch. We serve a variety of Mediterranean specialties, including thin crust gourmet pizza, delicious paninis, gourmet pasta dishes and fresh salads. We also provide catering services.